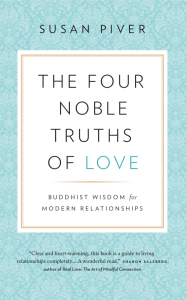 Susan Piver: The 4 Noble Truths of Love. Susan Piver is the New York Times best-selling author of 9 books, a speaker, and founder of the largest virtual mindfulness community in the world, The Open Heart Project. She has been featured on Oprah, TODAY, CNN, speaks around the world and leads teachings and retreats on Buddhism, meditation, relationships and the essential practices for a life well-lived. In her most recent book, The Four Noble Truths of Love, she offers a powerful set of tools to reimagine and better navigate long-term, loving relationships in a way that respects each person’s individual truth, while making space for a living, evolving container for love. In our podcast conversation this week, Piver shares the eye-opening revelation that brought her to the Four Noble Truths of Love, then walks us through each one. She reveals the genesis of this work, her own 20-year marriage, her struggle with attachment to “what was” and the innately human need to contain and define and preserve it. And, she shares her awakening to how trying to lock something living and breathing and changing into the confines of something simple and clean and certain can only lead to suffering, while the opposite just might lead to freedom and a deepening sense of connection. To watch to Piver’s incredible journey from Austin bartender to music industry exec to bestselling author to Shambhala meditation teacher, check out our earlier conversation here. Camp Good Life Project – BIG ANNOUNCEMENT – This is the final year of Camp GLP. It will be a celebration like no other. Join us and some 400 amazing people from around the world for 3 ½ days of connection, discovery, rejuvenation and reinvention and for a limited time, save $100. Learn more and grab your spot today!